Find curious and unique craft beer inside a Midtown Harrisburg gem, Zeroday Brewing Company. It&apos;s your neighborhood pub that’s just a little weird. And that’s the way you like it! 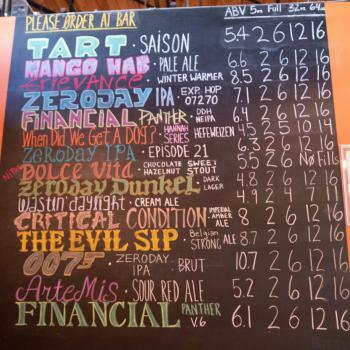 See what&apos;s on tap at one of our region&apos;s favorite craft breweries and learn what the heck a zeroday is! Zeroday has an eclectic line of brews from their tried and true flagships to novelties and daily infusions. Their bold, refreshing, and just a little spicy Mango Hab is brewed with sweet mangos and habanero heat and was highlighted in 2016 as an essential summer beer by Men’s Health magazine. The Dolce Vita chocolate hazelnut sweet stout is like dessert in a glass and served on nitro for a smooth, creamy texture. Their impressive list of past and present batches also humorously highlights each beer’s hobbies. The Positive Vibes wheat ale with pink peppercorns and grapefruit is known to enjoy hiking, music festivals, and picnic lunches. Their flagship imperial amber, Critical Condition, likes adventure sports, rugby, and bubble baths. Another flagship, Wastin’ Daylight, is a crisp, refreshing light cream ale that spends its time walking Basset Hounds, front porch sitting, and Willie Nelson songs. Each time you visit their brewery, there’s a list of unique, daily infusions that combine their on-tap selections with fruits, herbs, tea, juice, and more! They often theme their menus for holidays and whatever strikes their fancy: Presidents Day, Pokémon, Monty Python, The Simpsons, The Office, and more! Ask for a pour of their featured Zeroday IPA. So far they’ve created more than 20 uniquely crafted iterations with no two batches the same. Their Financial Panther series is a collection of Northeast and New England IPAs is inspired not only by the beer but the prowess needed to run the business. Zeroday is no stranger to kooky ideas, off-the-wall ingredients, and non-traditional brewing processes. Like when they put a 6-foot Douglas Fir tree right into the brew kettle to make their D.T.F. (Douglas The Fir) Saison! Zeroday’s home is Midtown Harrisburg, a funky, eclectic neighborhood of people who like to eat well and drink well. So many visitors ask us where they can get a local pub experience. Zeroday is it. The brewery is community-focused, continually innovating their tap menu, and open for a good time. Zeroday’s tap room is located on the corner of 3rd and Reily Streets adjacent to the Midtown Cinema. You’ll know you’ve arrived when you see the colorful, welcoming, and Instgram-worthy Harrisburg mural along the brick wall. Upon entering the tap room, you’re greeted with energetic orange walls and a friendly cast of characters behind the bar, around the bar, and at the tables within. For a first-time visitor, we recommend filling up a flight board with 6 pours of your choice. With a mix of flagships, seasonals, and daily infusions, there’s a lot of flavor for you to sip and sample. While you’re quenching your thirst, satisfy your food cravings with a pizza from Knead Bar Pies. They offer small, large, and gluten-free pies with a variety of sauces and toppings including tried-and-true options like pepperoni and mushrooms to unusual additions like spicy soppressata and pickled pineapples. Zeroday also has an Outpost at Broad Street Market, open Thursday-Saturday, where you can pair a pour with delicious made-to-order food. Grab a seat at the bar, chat up a local, and experience Midtown like a local. Midtown Harrisburg is also a source if inspiration for their brews like the Cherishburg sour pale ale inspired by Harrisburg. 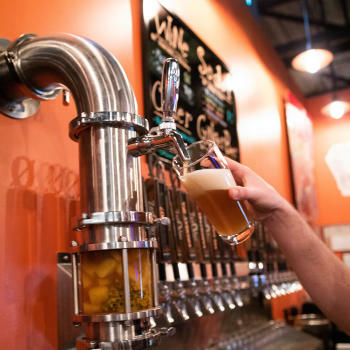 They also draw on local relationships like Firehouse Restaurant for their Firehouse IPA and collabs with other breweries that yield deliciously designed draughts. A brewery who gives each beer a personality profile must have a good story behind their name. Zeroday is a term familiar to through-hikers who spend weeks or months on the trails. A Zeroday is when you log 0 miles, trading the trails for a little downtime, relaxation, and recovery. 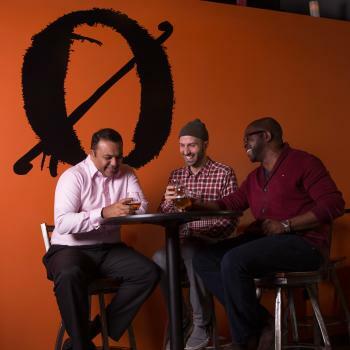 Zeroday Brewing Company is that kick-back place for thirsty travelers where you can unwind, hang out, and strike up an interesting conversation. Zeroday was founded by Theo and Brandalynn Armstrong who dreamt of a life beyond the corporate climb. Theo had been a homebrewer, and the pair decided to try some recipes for commercial production. As they poured a few samples for the community to get the word out about their brews, they successfully ran a crowdfunding campaign to power their dream. 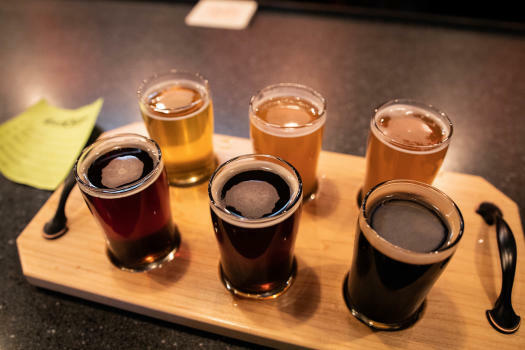 And now you’ve got their brewery on your list of things to do when you visit Harrisburg!